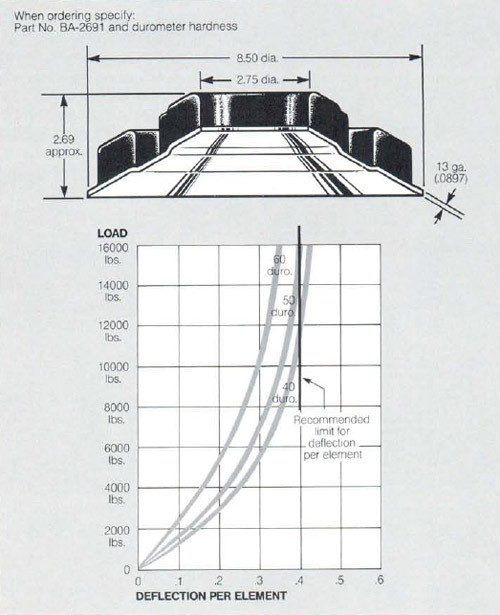 For over 50 years, we have developed solutions to manage motion and minimize resulting noise, vibration and shock. We are looking forward to working with you and solving any challenge you may encounter. If we don’t have an existing answer to your specific needs we shall work with you and create one from scratch. In 1991 Vibration Isolation Products, Inc. purchased the Firestone/Bridgestone product line of industrial machinery mounts. You may find our entire product line of the Firestone Mounts listed below. Please contact us if you have any additional questions about our products. 1. Ease of installaion -the underside of the centerinsert is a socket adapted to receive a standard hexagon nut, and is provided with two ears which can be bent over with a cold chisel to retain the nut in place, thereby allowing the machine to be placed on the mounting and a bolt or cap screw inserted from the top. 2. Factor of safety – the telescopic inserts provide considerable stability in all directions in ahorizontal plane. Also, because of the vertically interlocking flanges, a factor of safety is provided such that unforeseen dynamic forces or complete disintegration of the rubber by fire etc, will not permit the machine to topple from its foundation. This mounting was designed for relatively light compressive loads in the range of 100 to 400 pounds. It is composed of a ring like stamping, with two ears suitable for anchoring mounting, and an upper metal insert which is tapped to receive a standard 1/2″-20 bolt. The ring-like stamping and the upper metal insert are displaced one from the other bya alayer of rubber. Both the stamping and insert are vulcanized to the rubber. The mounting is small, compact and easy to install. It can be fastened to the floor, or other base, with bolts through the two ears of the metal stamping. The machine to be isolated may be set directly on the mountings and fastened to them by screwing a 1/2 bolt directly into the upper metal insert of the mounting. These mounting should be used ina manner similar to the typical installations as depicted on sheet titled “Application of Type CA-368 Machinery Mountings.”They may be used in conjunction with rebound mountings type CA-368 No.6, 7, or 8 in pairs, or in combination with any CA-368 mounting. This unit resticts the free movement of the machine to be isolated, to some extent, which is very desireable in some installations. Care must be taken when making any installation to see that the nut is not drawn too tightly as this would put too much pre-compression on both the mounting and the rebound unit, and, as a result, the set-up wilnot function properly. The use of a shoulder bolt is desirable to prevent an excess of inital compression. Use of metal cup DA-993 recommended. These units were specifically designed to be used in conjunction with the CA-368 No. 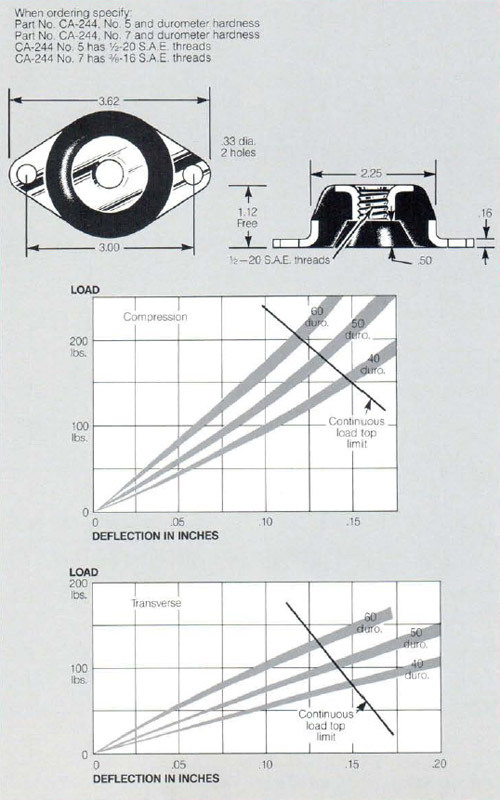 1,2,3 or 5 mountings as depicted on the sheet titled “Application of Type CA-368 Machinery Mountings.”The rebound unit is used to limit the movement of the machine on the rebound which is caused by the shock or vibration. Care must be taken when making any installation to see that the nut is not drawn too tightly as this would put too much pre-compression on both the mounting and the rebound unit, and, as a result, the set up will not function properly. 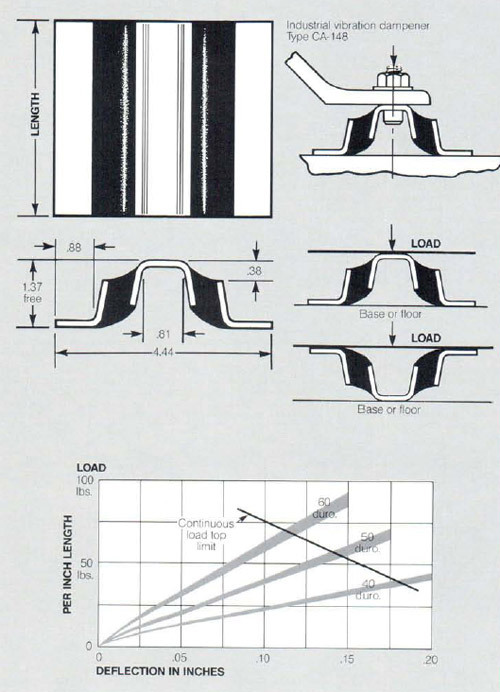 In certain instances it might be desirable to use the rebound unit itself as a mountiing or vibration dampener. 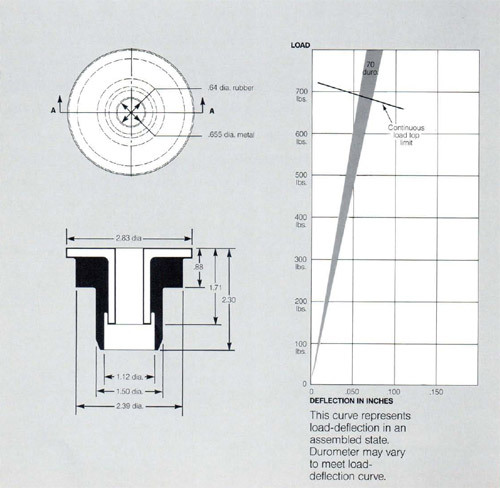 ( This application is also shown on the sheet titled “Application of Type CA-368 Machinery Mountings”). Use of metal cup DA-993 recommeded. The V.I.P.Corp, Industrial Vibration Dampener, CA-148 is a very versatile mounting, well adapted for a wide variety of industrial purposes. This mount is available in standard 36 inch lengths, or you may cut the CA-148 to fit your requirements. Other lengths can be furnished on special order. 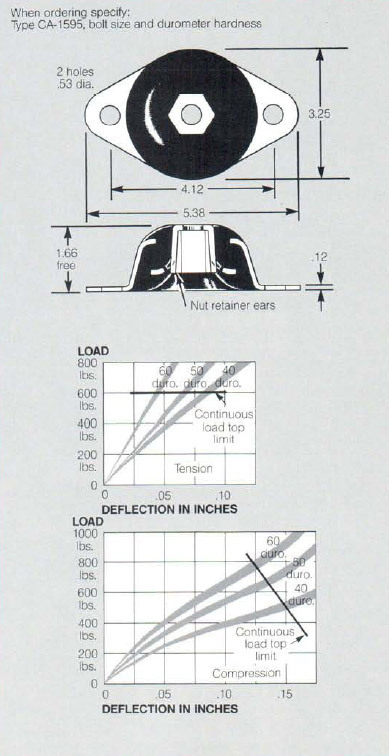 Shown are two suggested methods of installation of this mounting. Selection of the proper length for a given durometer hardness may be quickly made from the table. This spring disc was designed to replace heavy steel springs, such as those used in the trucks of the modern day railroad coach. however, it is felt that it may lend itself to many other applications in industry where a rubber spring is more desirable than steel. It is contemplated that in the near future we will produce parts of similar design which will carry loads up to 30,000 pounds. These discs may be stacked one on the other in order to obtain the length of spring and the deflection which is desired. 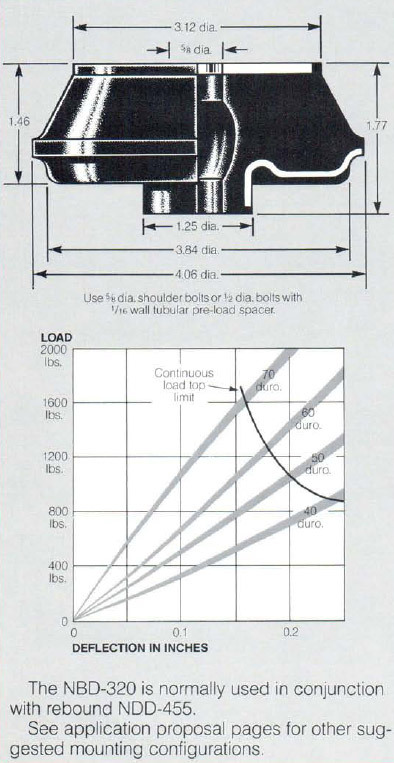 When used in this manner, the vertical height of each disc is approximately 11/8″ when unloaded. A center rod may be used for stability if needed. 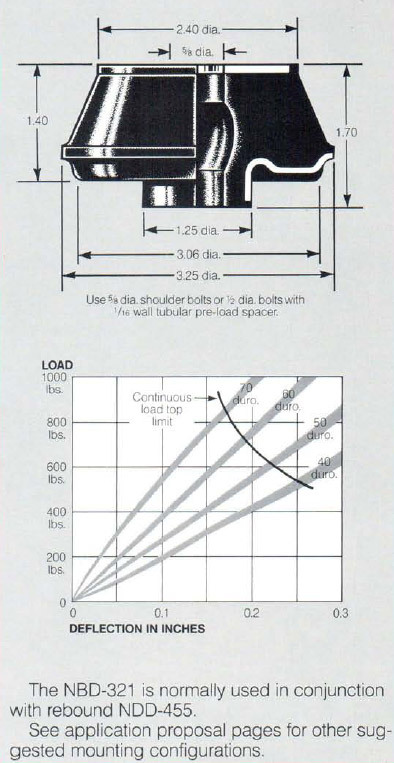 Where a stack preload is provided by a bolt, or rod passing through the center of the stack a maximum rod diameter of 1.75 diameter is recommended. 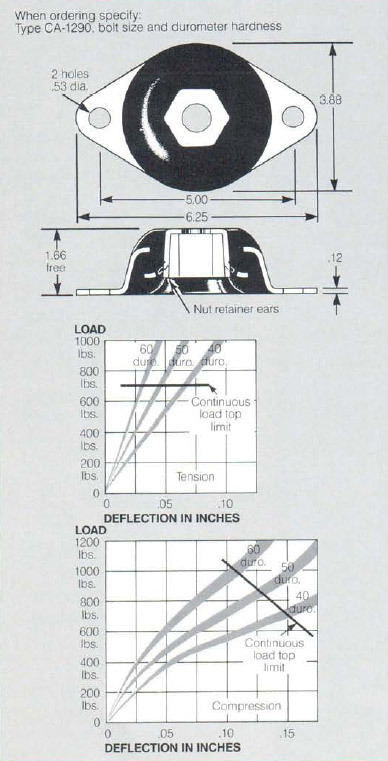 This clearence is required to prevent interference due to rubber distortion under high peak loads. These spring discs are not carried in stock but can be manufactured to order in the durometer hardness specified.